Bootie LA returns to The Regent Theater to pay mashup tribute in an epic battle of the blondes -- it’s Britney vs. Taylor Mashup Night! Two of your favorite divas from the past two decades, mashed up with anyone and everyone -- no era or genre is safe! Only $5 before 10 PM! 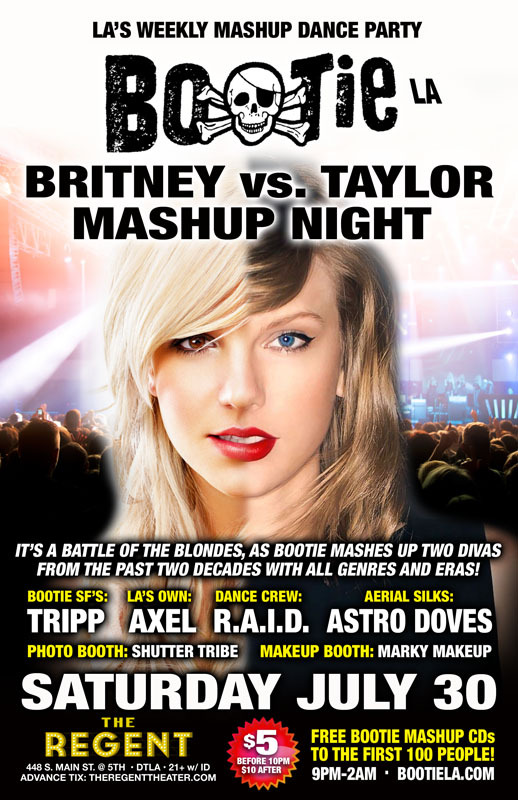 Bootie LA pays tribute to two of today’s modern divas, by having them battle it out at the club for mashup pop supremacy – it’s Britney vs. Taylor! Special guest DJ Tripp from Bootie SF joins LA’s own Axel in spinning the greatest songs Britney Spears and Taylor Swift have ever created, and giving them the Bootie treatment and mashing them up with anybody and everybody! Astro Doves will perform aerial silks high above the stage, and resident dance crew R.A.I.D. (Random Acts of Irreverent Dance) performs a divalicious Midnight Mashup Show as well as their normal go-go insanity, while Marky Makeup makes you up fancy, and Shutter Tribe will be on hand to capture all the fun! All this, plus FREE Bootie mashup CDs for the first 100 people through the door!